Parents would always lament on how difficult it is to bring their little ones in different places. It is hard to travel the babies in vehicles, and it is even worse when babies need to be changed in public places. These are just some of the reasons why some parents choose either to hardly or never bring them to various locations as logistics for a baby could be a nightmare. Fortunately for parents, bassinets have evolved to keep up with the fast-paced and more challenging lifestyles If you are on the lookout for one, then you might want to consider getting the Scuddles 3-in-1 Portable Bassinet. The Scuddles 3-in-1 Portable Bassinet promises convenience and peace of mind for parents and comfort for the little ones. 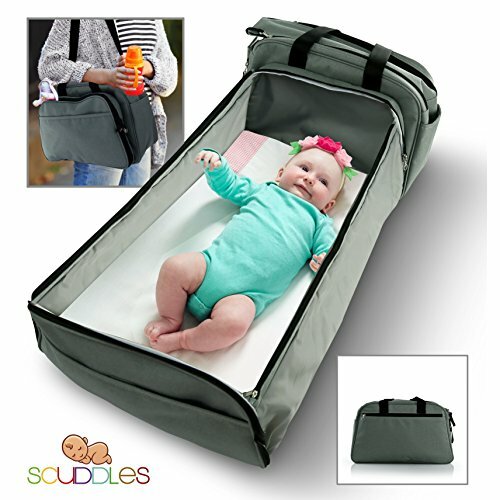 This item from Scuddles is a travel crib that is a very versatile product as it can be used as a crib, portable baby changing station as well as a diaper bag. The item was designed for the convenience of the parents as it comes with five zipped compartments as wells as an insulated pocket for things that need to be kept in either hot or cold temperature. The compartments and pockets can fit bottles, diapers and even the favorite toys of the little one. This portable bassinet comes with a mattress pad that can be washed in a machine. The product is made from 60 percent cotton and 40 percent polyester. The manufacturer promises that babies will not smell any strong chemical scent when placed inside the product. This 3-in-1 product comes with the special sticks to hold the walls up when used as a bassinet. Parents do not have to worry that the walls will collapse when transformed into a full-blown bassinet. The product weighs one pound and measures 8 x 3 x 8 inches when used as a bag and 12 x 24 x 6 inches when expanded into a bassinet. It can carry babies up to 18 months, depending on their size. This 3-in-1 product by Scuddles promises convenience, peace of mind and safety for the parents and babies. It was designed for parents who do not fancy tugging along so many bags along with the baby. This versatile bag has five zipped compartments where parents can place a variety of items for the baby like toys, diapers and small towels. It also has an insulated pocket for the infant’s bottles or the parent’s drinks. The product is versatile enough to be used as a bag, changing pad and a crib. Parents need not worry as the product is free from harsh-smelling chemicals. Plus, the item comes with sticks to hold the walls up, preventing them from collapsing. It also comes with a padded mattress that is machine-washable. However, users will need to buy separate handles if they wish to hang this item on the stroller as it has short ones. Plus, sometimes older babies can get out of the walls because the sticks do not hold them up when challenged by a persistent and energetic little one. This Scuddles portable bassinet or travel bag is highly similar to other products on the market because of its design and function. For example, the Chubbi Baby 3-in-1 designer diaper bag has the same function and design as it also has an insulated pocket for the bottles as well as five zipped compartments where parents can place the baby’s necessities. This product from Chubbi is slightly better than Scuddles as it comes with a stroller and shoulder straps. However, this Chubbi 3-in-1 designer bag emits a strong chemical scent and does not have the sticks to prevent the walls from collapsing when used as a bassinet. The product is not very durable either. On the other hand, Koalaty 3-in-1 baby travel bag does not come with a stroller straps just like Scuddles’ product. This item from Koalaty only has four zipped compartment and no insulated pockets, unlike Scuddles’ bag. It is also difficult to place items in the outside compartment and nor does it come with special sticks to hold the walls of the item. Parents have plenty of things occupying their thoughts, including the safety of their little ones. Luckily, manufacturers like Scuddles have come up with products that make the lives of the parents a lot more convenient without compromising the safety of their babies. This Scuddles 3-in-1 Portable Bassinet promise convenience as parents can use it as a changing pad, bassinet, or bag. It was designed for the convenience of the parents given that it has pockets including insulated ones for the babies’ bottles. Babies’ safety is neither compromised with this product as it is free from chemical smell and has special sticks to prevent the walls from collapsing when used as a bassinet. The item also comes with a machine-washable mattress pad that is padded for the comfort of the little one. Plus, it can fit inside a stroller. However, the product is not perfect as its handles are too short for parents to hang the bag on the stroller. Users will have to buy a longer handle for it. Also, it might not be perfect for bigger and already agile babies as they can climb over the walls of the bassinet. But despite the product’s misses, this Scuddles bag and crib is still very much worth buying. For one, it has the sticks to keep the walls from collapsing, a feature that is unique to the product according to the manufacturer. Other similar items, such as the Chubbi Baby 3-in-1 designer diaper bag and the Koalaty 3-in-1 baby travel bag do not have this safety feature. Indeed, the Scuddles’ product is more durable than others. In the end, this product by Scuddles delivers convenience for parents and comfort and safety for the baby just as it has promised.